Don’t worry, I have not suddenly gone paleo and eliminated all of the grains from my diet. I am Italian, after all. However, I have recently really developed an affinity for grain-free baking! And not because I have issues with grains, but because a muffin made with almond flour and coconut flour is so much higher in nutrition than a muffin or cookie made with wheat flour, and especially refined white flour. Making a muffin that is made with a base of almond flour and coconut flour means that it is filled with healthy fat, protein, and fiber, amongst other things, which wheat flour couldn’t hold a flame to. Another major bonus with grain-free baking is that the muffins maintain their taste and texture much longer than a regular muffin. 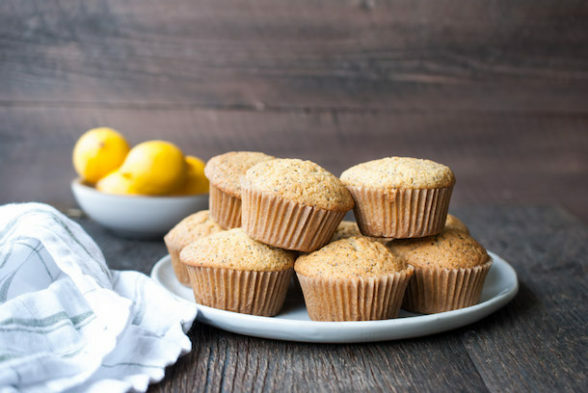 I have kept these muffins and other grain-free baked goods in the refrigerator for days and they stay perfectly light and fluffy with a nice moist crumb. And to be honest, when I make regular muffins, no one has too much interest after the first day. In my classes, I often times will encourage my students to adapt recipes they love- swapping in and out different ingredients and spices to mix it up a bit. However, I have found myself discouraging them slightly from playing around with swapping out grain-free flours for standard grain flours, because it is not so cut and dry. For example, if you were to take a basic muffin recipe and swap the white flour for coconut flour, you would end up with a complete disaster. And that is no good because not only do you have a failed muffin batter on your hands, but grain-free flours are much pricier than others, so I don’t want anyone to be wasting expensive ingredients. However, this is a great base recipe that you can tweak and add different flavors to come up with all sorts of combinations. For example, you could add in fresh blueberries for a blueberry lemon muffin. The poppy seeds here are really just for fun, although I do love the bit of texture that they lend, but if you do not have them on hand or don’t want to buy them, the muffins will still be delicious without. Or, how about omitting the lemon and poppyseed and adding some cinnamon, nutmeg, and diced apple? Anything really goes here as long as you are keeping the same ratio of flours, eggs, and fat. I’m going to make these for my nieces and nephews this week while I am on Long Island. I think they will love them. My kids and husband did as well and now that it’s August (yikes! ), I may want to consider a back-to-school plan and make some muffins to freeze for later. Let’s not get too ahead of ourselves though. I’m just trying to get through this week! Preheat oven to 350 degrees. Line a standard muffin tin with 10 unbleached parchment liners. In a medium mixing bowl, whisk together the eggs, maple syrup, coconut oil, and vanilla. Pour the egg mixture into the large bowl with the dry ingredients and combine well. Pour the batter into the prepared muffin tin, filling each cup to the top. I like to use a very large glass measuring cup to do this. Bake until lightly golden and when a toothpick inserted comes out clean, about 26-30 minutes. 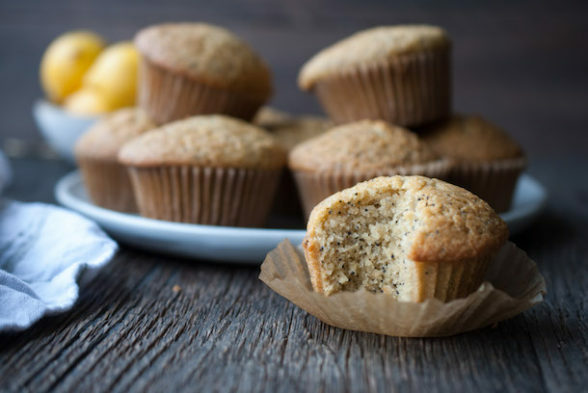 I love poppy seed and lemon and would love to try this recipe. I am curious as to the difference in outcome between using the combination of flours and arrowroot powder as opposed to using regular flour? Does it produce a lighter muffin? I prefer a moist muffin to a dry one and am curious to know and if it would be ok to add some lemon juice?? I think adding lemon juice would be fine. This recipe is designed to be a grain-free recipe and cannot be changed to use a wheat flour just by subbing it in one-for-one with the almond flour, etc. Grain-free baked goods tend to last longer and maintain more moisture than grain flour ones. I made this recipe as an 8 x 8 cake and it was soooo wonderful! I cooked it for the normal 30 min. and it was perfect. I used honey so I didn’t get the spike of maple sugar and it was a terrific choice. This is definitely a new “go to”, light, fluffy, snacking cake for me. Perfectly lemony and sweet without either being overbearing (and I was surprised since there is no lemon juice in the recipe, only lemon zest.) The poppy seeds did add just the perfect amount of slight crunch which was a nice texture. Really delicious! I couldn’t find arrow root powder in store so I’m going to use cornstarch instead. I hope it doesn’t hurt the recipe to much. Would tapioca be ok for a substitute? Well, I haven’t tested it with cornstarch which is not one of my favorite ingredients because it’s very processed. If you go to a store with a Bob’s Red Mill section, you’ll find a nice big bag of arrowroot at a good price. Otherwise, I would try tapioca or cassava flour. Let me know how it turns out! These were incredible. My toddler now refers to all treats as “lemon cake.” Delighted by the use of almond+arrowroot as a genuinely good/MOIST gluten free mix! I added a ton more poppy seeds (just a preference) and they came out fine. And used mini muffin tins because that’s what I had. Do you think a loaf pan might also work (before I ruin the next batch)? Hi! So cute! I haven’t always had the best results with grain-free batters in a loaf pan. Sometimes they turn out kind of flat. I know it would work in a round 8-inch or 9-inch, but I haven’t tried a loaf pan yet. Let me know if you go for it! I made these for our little road trip this past weekend and they were so moist and quite yummy. I want to make these one more time before blueberries are gone. I too, can’t wait to try the apple, cinnamon and nutmeg version. I love that they are filled with the extra protein from the almond flour. I also made your green muffins so my nieces would have a muffin to eat (they are only 9 and 10 months old). We love those. And, I made the grain free banana muffins from your cookbook. They were actually the biggest hit. Everyone loved those. They were all gone by the end of the trip. I did add dark chocolate chips to them because I am always up for anything banana and chocolate. 🙂 They were delicious! Thank you! Sure! Try olive oil or avocado oil. Just make sure the oil you use doesn’t have a strong flavor. Hi Pamela – these look like a delicious alternative to my standard lemon drizzle cake. To make it vegan, what can I sub for the eggs? Wow! I’m looking forward to making these muffins because my husband will not eat foods made with grains. You will both love them! This is a wonderful recipe, producing muffins that are so moist and light! I used our famous Jersey blueberries, and the muffins were fantastic! Even my husband, who doesn’t really like muffins, thought they were great. I look forward to autumn and apple spice muffins. Thank you once again for another delightful and easy recipe! You’re welcome, Mia! I was inspired by your blueberry version and made them that way for my nieces and nephews who absolutely loved them! Really looking forward to making this recipe! 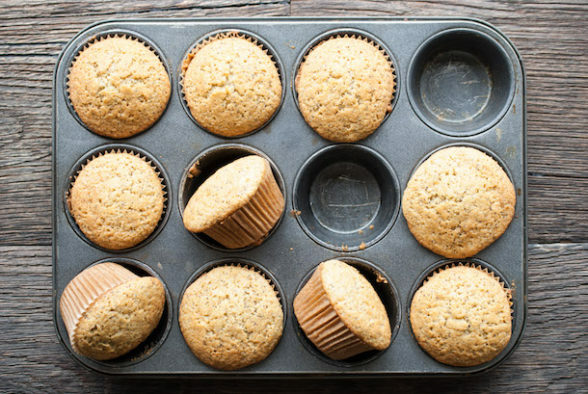 Question, if you are using a non-stick muffin pan, do you have to use paper cups? Or is it that you are wanting to put a buffer between the metal and the food? Also, I’m excited to try this blend of flours. Just out of curiosity, could this mix also be swapped out for the wheat flour in the vegan snacking cake recipe? I would still use the paper liners as a buffer. 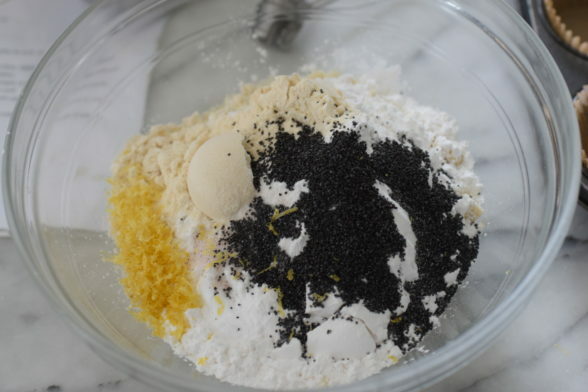 I think you could use this blend of flours and then take out the zest and poppy seeds, but add in the spices and apples! Love that there can be so many different combinations to make this wonderful recipe into so many more wonderful recipes! 2 questions. If you use blueberries instead of the poppy seeds as you mention as an option, do you need to bake it for longer? Also, if you make it as a snacking cake (sheet cake style), might you have a recommendation on how much more or less you would bake it? Thank you again for every bit of goodness you bring into our lives! You do not need to bake longer with blueberries. If using frozen, defrost first. To make into a cake, I would use an 8- or 9-inch square or round. Not sure how to long to bake it for, but I would test it after 30 minutes. Hi Pamela! I’ve only recently discovered your blog and bought your cookbook. I’ve made a couple of recipes and love them! Thank you for sharing your wonderful recipes. I don’t have anything against grains either, but I do try to avoid gluten as much as possible due sensitivity. I enjoy the Paleo baking recipes so much more than the gluten-free due to the use of almond and coconut flours. I realize grain-free makes everything gluten-free, but the ingredients are vastly different from the Paleo Diet versus the Gluten-free Diet. I’m looking forward to making this recipe, it looks delicious!